The 5th Stone - The World's Strongest Man Blog | The World's Strongest Blog! 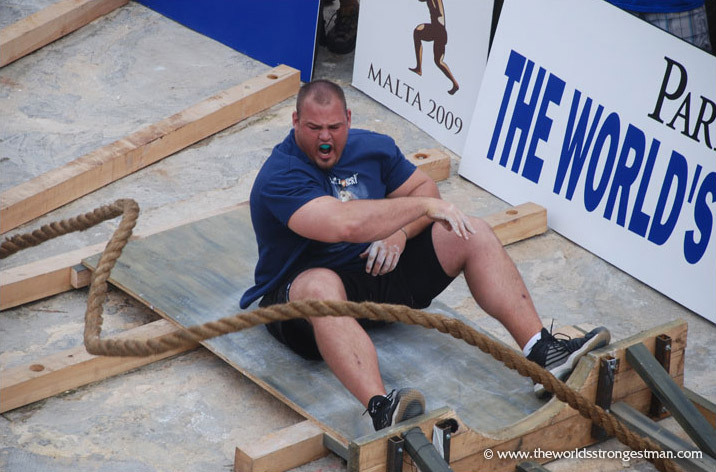 A review for World’s Strongest Man 2012 has been posted here – enjoy! Apologies for not updating this blog, life has gotten very busy in the last few months, both at work and at home. I have decided to leave this blog as it is but all new WSM posts will now be on my main website over at thefable.co.uk/ which is where you will find my latest post: World’s Strongest Man 2011 Groups and My Predictions – see you there! One of the brightest prospects in Strongman, Stefán Sölvi Pétursson, agreed to answer some questions, and this it what he had to say. How has 2011 been for you so far? 2011 has been good so far training wise. I have been hitting pb’s on few events so things are looking great. You are best known for being a professional Strongman, was that always your dream or did you want to be something else when you were younger? I wanted to be alot of things when I was a kid and strongman was one of them. At the age of 4 I saw Jón Páll, Magnús Ver and Hjalti Árnason doing a strength exhibition at a local grocery store. That gave me a spark that I still feel today and is the reason why I do this sport. Iceland has had two 4 time champions, who do you consider the better out of Jón Páll Sigmarsson and Magnus Ver Magnusson? For the record, in my opinion Jon Pall Sigmarsson is the greatest strongman ever, the perfect combination of strength and personality that made him so good to watch. You are putting me in a difficult spot there 🙂 No comment although I’ll say Jón Páll is my idol and has been since I was 4 years old. How did it feel to be crowned Iceland’s Strongest Man (first in 2009 and again in 2010), a title won by both Sigmarsson and Magnusson in the past? Felt good. I compete to win. Just what is it Iceland that produces such great Strongmen? Viking warrior heritage. Only the strongest survived Iceland’s harsh enviroment during the 1000+ years we have been on this soil. 2010 was your first time in the World’s Strongest Man final, having gone out at the group stages in 2008 and 2009. What was different in 2010, that saw you step up to the next level and compete amongst the World’s elite? I went to Zydrunas Savickas in Lithuania for training camp in august. Training with him and spending time with him helped me tremendously. You didn’t just compete in the final, you came in 4th, which is an amazing performance for someone in their first WSM final. How did it feel to do so well and do you think you can do better in 2011? Getting 4th place felt good but many guys were fighting injuries or coming out of serious ones. But then again that is part of the game so I was happy but still feel like I have so much room to improve. And regarding to 2011 I’ll just say that I want better results and to get stronger and better each year so 2011 is no diffrent. It will be hard but I’ll fight. When I announced on Twitter that I was going to be interviewing you, Matt (@njstrongman32) said he gives you 3-5 years till you become World’s Strongest Man. What’s your reaction to that? I’m happy with that of course and would like to thank him for believing in me. What event is your speciality? I’m striving for the sport of strongman to be my speciality. But I can be good at stones and want to be the best. Who do you think is the greatest Strongman ever, the greatest competing today, and apart from yourself, who do you think represents the future of World’s Strongest Man? But I The greatest strongman ever in my heart is Jón Páll Sigmarsson. But in reality it’s Zydrunas Savickas. I like to believe I am part of the future for WSM. But there are many extremely strong, powerful and talented guys out there. One name stands out today and that is Brian Shaw. I also believe Terry Hollands can do great things as well as Johannes Arsjö and Vytautas Lalas. We have a great guy coming up in Iceland as well in Hafthor Julius Bjornsson just to name some, there are so many more. Who is your best friend on the Strongman circuit? We are all friends but I stay most in touch with Johannes, Brian and Terry. Outside of Strongman, what do you do to relax? Listen to music, hang around with friends and eat good food. For anyone out there wanting to follow in your footsteps and become a Strongman, what advice would you give them? Always remember why you love the sport and that it is for fun. Sorry, one last question. While watching the final I calculated that you should have got 6 points (5th place) for the Giant Log Lift but were only awarded 5. You should have ended up on 33 points but were only awarded 32. Were you aware of this and was there an explanation why? I wrote about it here. I had no idea about that. I don’t check out the points really unless I’m fighting for the win. Thanks to Stefán for taking the time to answer these questions and I’m looking forward to seeing him compete in 2011, and especially in the Atlas Stones – can he become the world’s best? 28 year old Brian Shaw burst onto the Strongman scene in 2005 and made it to the World’s Strongest Man heats in 2008. In 2009 he came 3rd in the final and just last year he came 2nd to Zyrdunas Savickas. At 6′ 8″ he’s hard to miss, but Brian is as friendly as he is strong, and as such agreed to answer a few questions. Here’s what he had to say. Congratulations on your superb performance in the 2010 World’s Strongest Man Final – how did it feel to come so close to winning and only lose on count back? The way the 2010 WSM ended was very tough. To end in a tie on points and loose on a countback was a bad feeling. Now that it is over and done I have tried to take the positive points out of the contest and I will be working to improve for this years WSM. How many times have you watched the video of the Loading Race and wondered ‘if only’? Watching the loading race was very hard. I really did think that bag was going to stay on the platform and everytime I watch it somewhere in my mind I know that cost me my first WSM title. In 2008 you failed to make the final and then went on to come 3rd in 2009 and 2nd in 2010. What did you do differently to make such a huge improvement? I have learned so much since 2008. I actually cut about 10-12 lbs going into WSM that year which was a huge mistake! I know a lot better how to train for WSM and I am comfortable with the contest format which also helps a lot. Was Strongman something you always wanted to become involved in, and if not, what made you decide it was for you? I watched WSM from when I was very young. At that time I never knew I would be able to compete in WSM. I decided to start when I was 24 after I finished playing basketball and needed something to pour my competitive fire into. It was a very natual fit for me and has been awesome. You were the Strongman Super Series Overall Champion in 2009 and 2010, are you confident of making that 3 in a row this year? Winning the WSM Super Series the last two years has been great and I am looking forward to defending the title in 2011. What one event would you be confident of beating anyone in the world in? Right now I feel like I have a few events that I can win in any contest but my best event is the Atlas Stones. Lots of other guys have tried to lay claim to the title king of stones, or best in the world at atlas stones but I never have. I just go win the stones and let my performance do the talking. My track record in the past two years really speaks for itself on the stones. Who do you think is the greatest Strongman ever, the greatest competing today and apart from yourself, who do you think represents the future of World’s Strongest Man? I really dont know who I would say is the best strongman ever. There have been several guys who have been very dominant during their careers in this sport. I would name a few as being Bill Kazmaier, Jón Páll Sigmarsson, Magnús Ver Magnússon, Mariusz Pudzianowski, and Zydrunas Savickas. There are several other men who are close to these guys but in their respective era’s they were very dominant. As far as the future of strongman I think it is very bright. There are a number of guys who will be battling it out for the next 5 years. You were my pick to win World’s Strongest Man 2010, and you are my pick to win World’s Strongest Man 2011. What will you do to make sure you go one better this year? Well thank you very much for the vote. I learned a lot from the past two years about WSM and what it will take to win WSM. This year I plan on doing less contests to make sure that I train properly for WSM and come in ready to win. I am friends with a lot of the guys. I talk a lot with Dave Ostlund and Jason Bergmann in the USA. Overseas I talk with Terry Hollands, Stefan Solvi the most. What do you see yourself doing after Strongman? With your height and size, would you ever consider a career in pro wrestling? I am not sure what I will do after strongman. I still have a lot of goals to achieve so when I get those done I will think about what comes next. I like to do a lot of things for fun. Movies, hanging with friends, going out to eat, etc. Train hard. There is no substitute for hard work. Anything worth having will be worth working for! Catch up with Brian at his official website: shawstrength.com, on Twitter (@shawstrength) and on his Facebook Page. Thanks to Brian for answering our questions, and so quickly! We wish him the best of luck for 2011, where we think he’ll be crowned the 2011 World’s Strongest man – what do you think? What Mariusz Pudzianowski was doing this time last year – singing! The title of this blog post is no lie – this time last year Mariusz Pudzianowski was in the Polish version of Just The Two of Us which is a UK originating show that pairs a famous singer with another celebrity not from the world of music and they perform duets voted for by the public. As I did last year, I am going to look a little more closely at the points that were earned in this year’s World Strongest Man Final and see what we can gleem from that. So welcome aboard the geek train as we do the 2010 World’s Strongest Man Final ‘by numbers’! As always, click on the above image to see a bigger version, which when numbers are involved is always handy. Aside from the first event where he came a lowly 6th, it’s Zydrunas Savickas’s consistent high scores that handed him the title of World’s Strongest Man 2010. After the Loading Race he won 3 events, came 2nd in another and 3rd in the Atlas Stones. That’s a similar story to Brian Shaw, who also won three events, 1 tied with Savickas, and came 4th in 2 and 3rd in one. They both ended up on the same points and Savickas must have won the competition based on having more 2nd place finishes than Shaw. Mikhail Koklyaev competed very well in all events, and never achieved less than 5th place, twice coming 2nd and once in 3rd. The three podium winners placed well in all events and as such were quite a way ahead of Stefan Solvi Peturrson in 4th place and the rest of the field. Stefan also performed admirably for a first time finalist and if he can improve on his obviously weak events like the Deadlift and Loading Race then he’ll be a challenger for a podium place in 2011. Last year there were 5 different event winners, but this year only Savickas, Shaw and Ortmayer won an event. Of course that may have been different if they’d included the Plane Pull because even a Terry Hollands with sub-par training would be favourite to take that victory. You also wouldn’t want to bet against Travis Ortmayer in the Atlas Stones had he not been injured in the Giant Log Lift. 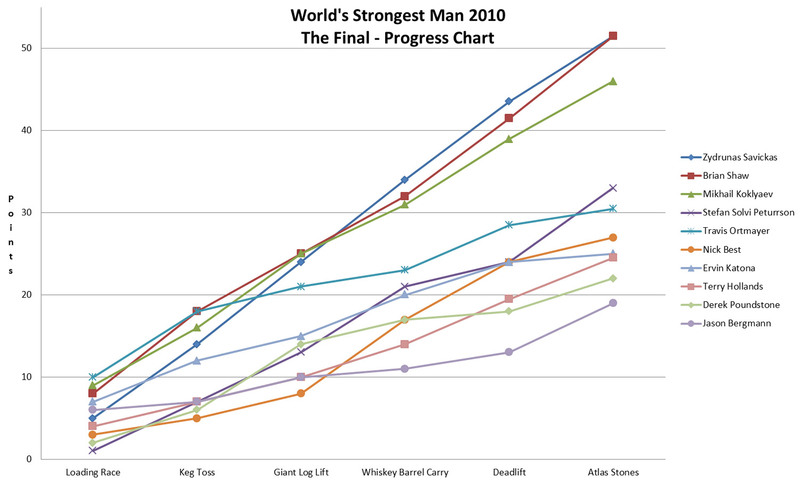 In fact, if Shaw hadn’t made that mistake in the Loading Race then he’d have won that event and not only would he have won World’s Strongest Man 2010 but only he and Savickas would have won events, which just goes to show how dominant those two were, amongst a field of injury riddled Strongmen. When you look at the events involved, there was also no Boat Pull like we saw last year. This is one that Brian Shaw destroyed everyone in last year and one in which Savickas only placed 8th in. Conversely, there was no Farmer’s Walk this year, and as strange as that felt, it’s an event that Savickas win last year and Shaw only came 7th in. It does seem that although the events were different to last year, they were well balanced in their choosing and catered for everyone’s strengths and weaknesses. I think we’ve dissected those points enough, now let’s look at how people’s position’s changed as the competition progressed. The most obvious change to me is Travis Ortmayer who is neck and neck for first place for two events but then he plummets after his injury. Interesting that although he was injured he only got overtaken in the last event when Stefan Solvi Pertursson managed to get 2nd place in the Atlas Stones. I think that’s testament to both Ortmayer’s determination and never say die attitude while injured, and the injury affected Hollands and Poundstone not being able to catch him up. While Best and Katona were actually ahead of Hollands and Poundstone I never expected either them to get high enough points scores to catch Ortmayer after his 18 point haul in the first 2 events. That’s not to take away from their amazing efforts, but in the arena of World’s Strongest Man there are some athletes that just stand out as super-human performers above the rest, and for Best and Katona that’s not a level they are at, yet. Eventual winner Zydrunas Savickas only took the lead after the 4th event, and 3rd place Mikhail Koklyaev was actually ahead of him for the first half of this year’s final. In fact he and Shaw were the only 2 athletes to stay in the top 3 all the way from the first event to the last, with Savickas struggling in 6th and then 4th place for the first 2 events. If you look at the purple line at the bottom on the far left, that’s where Stefan Solvi Petturson started the final, in last place. Then if you trace that line it starts to rise, and after the 4th event he’d pulled himself up to 5th place. It was then that magnificent performance in the Atlas Stones that saw him go ahead of Travis Ortmayer, who himself finished in 5th place for the 3rd year running. That about wrap’s up the 2010 World’s Strongest Man – it’s been fun writing about it and it was a great competition. I re-watched the 2001 World’s Strongest Man final last week and it’s given me the motivtion needed to write some blog posts on previous competitions, so expect some of those soon. I was also considering doing my own WSM Hall of Fame. The official World’s Strongest Man Hall of Fame can be found here and so far they have inducted Svend Kalrsen and Mariusz Pudzianowski. I have no delusions of grandeur as to how mine will be perceived but it’s a bit of fun and my way of acknowledged the greats of this much over-looked and amazing sport. As always, I welcome your thoughts, so I’ll see you in the comments! There have been many people coming to this blog after searching for an answer as to why 5 time WSM winner Mariusz Pudzianowski was not competing this year. Back in March I wrote a post reporting that Pudzianowski would be concentrating on his Mixed Martial Arts (MMA) career instead. Mariusz won his first fight against Marcin Najman in December 2009, and then fought twice in May of 2010. Having 2 MMA fights in one month is unhheard of, gone are the days when people fought multiple times in a day like used to happen in UFC and PRIDE. His second MMA fight was on May 7th 2010 where he beat Yusuke Kawaguchi by unanimous decision at KSW XIII. Then, just 2 weeks later on May 21st, he fought and lost to former UFC Heavyweight Champion Tim Sylvia by submission to punches on round 2 at Moosin: God of Martial Arts in America. Fast forward to September 2010 and this was when World’s Strongest Man 2010 was taking place in South Africa, but instead of taking part Mariusz Pudzianowski instead had a fight against Eric ‘Butterbean’ Esch at KSW XIV. Butterbean made his name as Super Heavyweight boxer and even had a boxing match at WrestleMania 14 against Bart Gunn. Pudzianowski made short work of Esch, taking him down early in the first round and then making him submit from punches. However, it’s not as simple as that as many people are saying the fight was fixed and Esch was fed to Pudzianowski in a bid to raise his profile. I’ll let you judge for yourself, watch and see what you think. In the fights I’ve seen Esch involved he’s never been very good once on the floor, and he is getting on a bit. Despite having some early success against credible opponents, he’s been a bit of a freak show attraction in recent years. Whether Pudzianowski’s punches had enough power to make anyone submit has been the topic of many an argument in the MMA world, what do you think? What is evident is the weight loss and muscle mass that has disappeared from Pudzianowski’s once Herculean frame. No doubt this was done to improve stamina but he’s hardly recognisable as the man who won World’s Strongest Man 5 times and thrilled the crowds with his feats of strength. If he were ever to compete in Strongman again, could he get back to the level he once was? I’d hazard a guess that he could, after all there are few that have ever trained as hard as Pudzianowski. He doesn’t have another fight planned yet, but I’ll be keeping an eye out for any news, though ideally I would like him to return to the world of Strongman as I’d rather see him battling Savickas in the Farmers Walk than an old has been in an MMA ring.